Fewer advances have improved the world of dentistry as much as dental implants. These tiny threaded posts can have a huge positive impact on your smile and your oral health. One of the most versatile procedures in dentistry, implants can be restored with crowns, bridges, and dentures. Best of all, they can last a lifetime with appropriate maintenance and care. 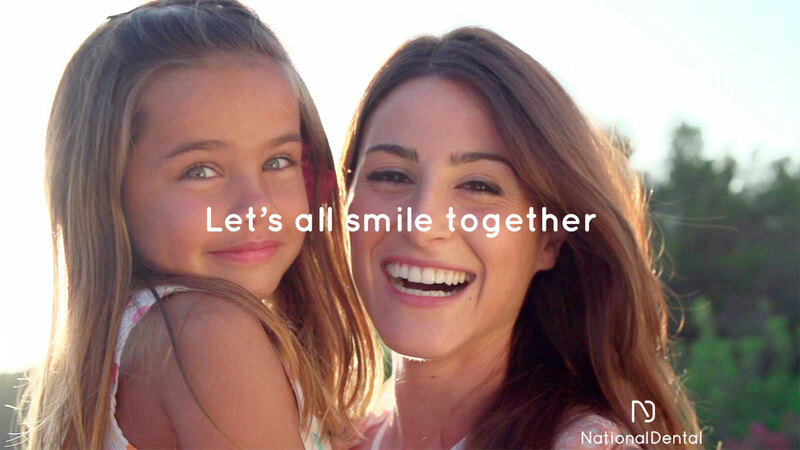 If you are looking for the best dental implants in NYC, look no further than National Dental. Most implants are crafted from surgical-grade titanium, although ceramic options are becoming increasingly popular as well. These tiny threaded posts are methodically placed into the jawbone during a surgical procedure. Replacing the roots of missing teeth, implants stimulate the nerves within the jaw in the same way. This feature is what sets implants apart from other forms of teeth replacement. Because the implants mimic natural roots, they prevent bone degradation – a byproduct of tooth loss – from occurring over time. Once the implants have fused to the jawbone in a process called osseointegration, abutments (posts) and custom restorations can be connected. 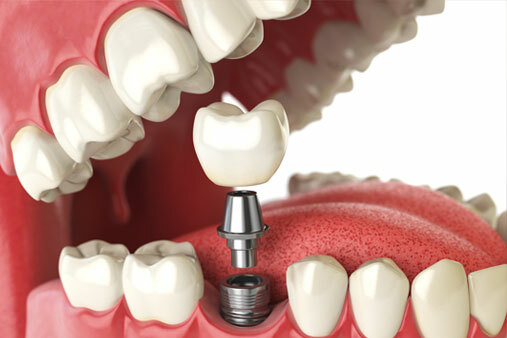 Patients who are missing only one tooth can benefit from a single dental implant. Traditionally, the only option for this scenario was a conventional dental bridge, which requires the reduction of the natural teeth on either side of the gap. In contrast, a dental implant does not involve neighboring teeth. Therefore, those who choose single tooth replacement with a dental implant can enjoy conservative treatment and long-lasting results. Individuals who are missing multiple consecutive teeth can opt for an implant-supported dental bridge. These restorations are anchored to implants rather than natural teeth. Therefore, healthy tooth structure is left intact. Patients who have worn dentures for several years can understand the challenges that come along with this type of traditional teeth replacement. Conventional dentures may move around or shift when chewing, eating, or speaking. However, if these prostheses are connected to dental implants, they will stay firmly in place. 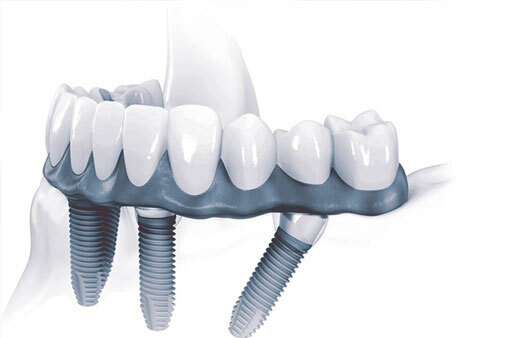 Full-arch replacement using dental implants offers unparalleled stability for optimal function. With this solution, patients are able to eat the foods they love in total confidence. There are several options, ranging from removable to fixed. We will briefly explore the most common treatments below. Those who are seeking additional stability for their removable prostheses can pursue implant-supported dentures. This option requires between two to six implants per arch, depending on your unique needs. Your denture will simply “snap” onto the implants. Available in varying retention strengths, they can be removed for easy cleaning, as well. If you are fed up with removable appliances, Four Ever Smile could be the solution for you. Using only four to six dental implants per arch, this system supports a beautiful zirconium fixed bridge, connected to the posts with either high-quality cement or screw retention. With this permanent solution, patients can function as though they had a full set of natural teeth. In years past, many patients who had been missing teeth for a prolonged period of time were not eligible for implants due to bone atrophy. The All-on-4 treatment concept maximizes existing bone so that patients lacking bone density can still qualify for this type of treatment. Best of all, a permanent prosthesis can be attached to the dental implants the same day as the surgery. Looking for the Best Dental Implants in NYC? Call Us Today. Missing teeth can have a negative impact on your quality of life. Dental implants can restore the health, function, and aesthetics of your smile. contact us online or call us at (516) 535-0544 for more information.